Another one of our So-Cal favorites. This delicious and quite pretty cocktail has a little heat and just the right amount of sweetness! Dessert in a glass! 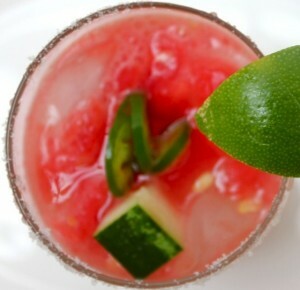 Fresh watermelon margarita. Add an extra sliver of fresh jalapeno for garnish/a little more heat if you wish! Salt or sugar the rim, optional. Add the tequila, liqueur, jalapeno. Squeeze the lime over the drink. Give a little stir and serve.